Apparently Batman's comic has run into the "dreaded deadline doom," because this is a throwback story that features the real Dark Knight, not the pretender who's been filling his cowl in recent months. 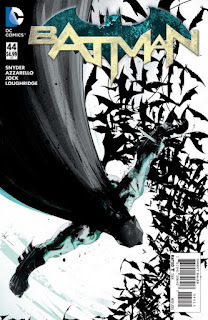 Ordinarily this is the kind of Batman story I like, with the focus on the detective side of the equation - but this story just didn't work for me at all. It begins with the death of a young man - he's been shot and then dropped from high in the sky. Batman vows to solve the crime and track down the murderer - but he doesn't actually find any clues to solve the mystery, he just talks to assorted bad guys and apparently believes every word they say. The story follows the typical TV detective show model, as probable suspects appear and are eliminated. Unlike most such shows, though, the villain at the heart of the murder isn't caught or even uncovered - it's all just setup for a story that may or may not be told in the future. Meh is right. It was nice to see the original Batman back at it, and I like a good detective story. But this just bounced around, trying to be overly clever.